Learn how to gamble resources based on how easy they are to replenish. Fuel is the hardest to replenish and required almost every jump. With chances on the game going extra jumps, you cannot gamble fuel. Population is the second hardest to recover, but one of the easiest to lose in bulk. A single bad space battle and Pop can dip badly. Risk this only if you are confident in your CAG and pilot(s). Food is the next easiest to regain, and rarely drops quickly. You can gamble with food a bit. Morale is the easiest to recover with a little effort from a political leader. Gamble this liberally, unless you distrust your president. First thing is first, before you start to play the game, especially with any new players, everyone should understand that all players must stare at their card for a full minute so that people can not try to cheat and notice who is sitting there and reading their card. If you drew a cylon card at the beginning of the game, try your best to memorize what your cards affect is. Some of the effects are more powerful than others. If you have the ability to damage Galactica twice, that can be pretty huge depending on when you reveal. Other reveal abilities are less potent. With the less potent ones, it might be better to try to force a failure on a crisis card that has a devastating affect rather than worry about getting your reveal bonus. You will have to discard most of your hand when you reveal, so using a hand full of cards to blow a crisis can be crucial. If the opportunity presents itself, the most devastating reveal must start with the turn directly before yours. For instance, if you have Helo (Agathon) , if you can use your moral compass to choose a really bad option on the crisis right before your turn, do so. Then use your cylon reveal ability as your action. This double whammy can sometimes be so much to overcome that the players start to lose hope. That is almost as important as whatever resources you damage. Also, such a bold move will usually give confidence to the other cylon player (if there is one). The best example of this technique is for the admiral. Try to blow the nukes in ways that seem feasible, but that are not too damaging to the cylons. If you can figure out who the other cylon is and you are the president. Start giving them titles and other benefits before you reveal. One thing is for sure, don’t reveal yourself a full jump after the sleeper phase has begun. It can be tempting to keep bluffing and skirting the line with loyalty of the other players. The damage that you can potentially do will be minimal if you wait until the last two jumps of the game. Depopulating the human fleet with the -3 risk early jump often isn’t nearly as good a coup for the cylon as it appears to be. The population dial has to already be low for this to help you. Otherwise you’re just helping the humans trade a resource they have to spare for a jump, which is what makes them win the game. If you really want to hurt the humans with an early jump, be sure that you or an allied cylon is currently the Admiral, so you choose a low-distance jump. In a best-case scenario, use scouting actions on the destination deck in previous turns to guarantee you have a 1 distance jump to choose. Remember that your best way to get the human’s population down is through raider attacks on their civilian ships. You can set these up with scouting missions, Boomer or Roslin’s powers, or by having a revealed allied cylon working the crisis deck or cylon fleet locations. The -3 risk jump might be the decisive extra that pushes them over the edge, but most population damage will come from killing their civilian ships. If it is your first game, or you haven’t played in a while, review the section on Cylon players BEFORE receiving your loyalty card. Asking to see the rules, will definitely draw suspicions towards you later. Even if you are innocent, this may cause some time in the brig! It will also make for a better game overall. In the last four player game I participated in, we had two new players who had never read the rules. They were taking advantage of the “it’s a co-op, so we will help you learn as we go” plan. However, when they never asked to see the rulebook, it helped me pinpoint that the game owner (who had read the rules) must be the Cylon! As the humans, always jump early. Jump the moment the readiness track hits -1. No excuses. Why? The whole game for the humans is about advancing the jump track. That’s the win condition. Everything else is a side quest or a distraction. Every time you jump early, you put another jump advancement marker towards winning. The jump marker you save by not auto-jumping will advance your next jump. Typically it’s going to take 5 jumps to win the game, maybe one more, maybe one less. Jumping at -1 means you only need 5 jump advancement markers per jump, not 6. So it’s only going to take you 25 jump markers instead of 30 to win the game. With 60% of the crisis deck having jump advancement counters on it, that means you have to survive ~37 turns to win, not ~45 as you would with auto jumping. That’s 8 less turns of everything going wrong. Less if you make clever use of scouting missions, and Boomer or Roslin’s powers. And what do you really risk by jumping at -1? You’ve got a 75% chance of losing 1 population, which is less than you were likely to lose to other crisis while you waited for that last jump advancement to come up. Not even 75%, because someone’s going to be holding back Strategic Planning to play on the jump. Now you’re only losing a single population half the time. On average, that’s 2 or 3 population lost over the course of the entire game, for massive savings elsewhere. And jumping is the best fleet defense, too. Since fleet attacks are the biggest danger to your population dial, you’re protecting it at least as much as you’re putting it at risk. Always jump one early on the track. Always always always. When you have the opportunity to expose a player’s loyalty (and you’re human), it’s usually best to choose the character who has the greatest ability to damage the human’s survival — and not try to guess who might be a Cylon. The Admiral and the President (in that order) are typically the most threatening to the Galactica if they are Cylons. It’s always good to know you’re in safe hands. One of the small flaws in this game is the meta-gaming that can happen. When identity’s are revealed through silly logical faults it takes away from the game. To avoid this when loyalty cards are dealt the house rule is that all players must keep their eyes on their own card while a slow count to ten is done by one person. This prevents the group from looking up and seeing who is actually reading their loyalty card which indicates Cylon. An excellent game that just need the cooperation of its players to make it an outstanding experience. Consider jumping at the -3 when a Cylon fleet is about to blow up your civvies anyway, or if you’re in the late game with population to spare. But the real time to jump at -3 is when you’ve got Helo in the FTL Control on his own turn, with a Strategic Planning ready to play. It has to be Helo’s turn, because his reroll power doesn’t work on other players’ turns – Executive Order doesn’t help here. On the good side, the game errata has clarified that a Strategic Planning played on Helo’s initial role carries over for free to the reroll. With a 50% chance of getting out scott free and a reroll if he fails, Helo only has a 1 in 4 chance of losing civvies on an early jump when someone pitches in a Strategic Planning, meaning he’s losing 0.75 population per jump this way on average. If you could pull this off for all 5 jumps of the game, you’d cut the number of cards you need to survive to win the game down from 45 to 30. Actually a little more, since you’re waiting to come around to Helo’s turn, which makes the math quirky. And your total population sacrifice is most likely 3 for the entire game. If you’re running low on population (and you probably aren’t, because early jumping has probably kept the cylon fleet from ever touching your civvies) then you can always fall back to the jump on -1 rather than -3 strategy. P.S. As usual, things are backwards if you’re the cylon, and then you can exploit the -3 risk jump to depopulate the human fleet. But don’t underestimate the savings you’re giving the humans by jumping them two turns early. The population dial has to already be low for this to help you. Otherwise you’re just helping the humans trade a resource they have to spare for a jump, which is what makes them win the game. 1) Do not create Loyalty deck, you play in full cooperation. 3) Lower all resources by 2. 1) Draw a random Super Crisis and resolve it immediately. 2) No Loyalty Cards are being drawn. All other rules remain unchanged. It’s not going to be easy game, but it will be satisfying. Enjoy! If you manage to discover a Cylon before they reveal themselves, it may be best NOT to publicly announce it. Wait until you are able to safely put them in the brig by surprise. If they know you are on to them, they will be able to cause a few more instances of sabotage before they need to escape to their Resurrection Ship. They will also be able to utilize the potent reveal ability on their loyalty card. By surprising them, not only will they miss out on some last minute attacks, but they may even keep assisting the humans to maintain their secrecy. I recently played Battlestar Galactica again and I was amazed how quickly fuel gets depleted. Crisis cards that cost fuel are very bad, because jumping also nibbles at the fuel reserves. So avoid losing fuel except when jumping or you may be in for nasty surprises. Losing the game due to fuel loss when everything else goes smoothly is no fun. For the humans of course, because if you’re a Cylon: get them to expend that fuel! It’s a quick way to turn a certain loss into victory for the Cylons! When you’re playing with a number of people that calls for a sympathizer card in the loyalty deck, one way to defang that threat is to purposefully knock one of your resources into the red before the second dealing of loyalty cards. If nobody knows they are the Cylon yet and you get buy-in from everyone, this is fairly easy to accomplish. If someone does know they’re the cylon, then, ironically, you can have a situation where that player is subtly trying to avoid the humans losing that resource! The cost of a resource in the red is probably worth the gain of not going up against another cylon after the halfway point. There is probably some argument to the best card in the base set and I hope people will post their opinions. Executive Order gets my vote. Using your action to give 2 actions to another player at the cost of a card that has a low skill check value is a great trade off. This card is especially powerful for pilots, getting rid of centurions, or for the president if they are in the right rooms. The one danger of Executive Order is if you do not know who the cylon is and you give them an XO at the right time, it can just about spell doom for the fleet. 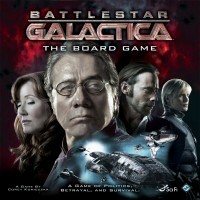 If you are hoping to be a Cylon, Gaius Baltar is one of your best choices for your character. His built in penalty, Coward, forces you to draw two Loyalty cards at the start of the game. Not only does this give you a higher percentage of being a Cylon, but two of your draws occur right at the beginning so you will probably know which team you are on early. This is a big help so that you can begin your sabotage right from the starting gun. And you can even try to keep all the resources in the blue to help guarantee another conspirator in the form of a sympathizer. As an extra bonus, Dr. Baltar’s Delusional Intuition will provide a nice way to gain skill cards outside of his skill set, which can be perfect for disguising his diabolical plans. And if nobody chooses Laura Roslin, you even get to start as President! Many players find it not fun to play with sympathizer in loyalty deck. Our group has found it more fun to remove the card from 4- and 6-player game and replace it with one additional “You are not a Cylon” and “You are a Cylon” card. This way there will be at least one Cylon (two in 6 player game) and perhaps another one. This gives more leeway for Cylon players and keeps up the tension of mistrust. Note this does give slight benefit on side the fortune favors, but in response it enhances one of best experiences of this game. Now this might come up as rather aggressive tactic in game where there are 2 Cylons. You play as Gaius Baltar and have the fantastic Cylon Detector ability and you’re a Cylon. Best moment of course is to use it when you sleeper phase has been activated and you suspect somebody to be a Cylon (other than you obviously). You find out that you’re right while checking it out, instead of protecting your colleague, reveal him as Cylon. With luck he/she can use reveal action and do some damage and doesn’t go to brig. Either way your reliability has been raised to new heights, meaning you can do a lot of damage whilst hidden and the impact will be harder when you reveal yourself. Might be that you can jam some of humans to brig in meanwhile. So in other words: act like Gaius did in series. We instituted this house rule when we first started playing. When looking at your loyalty card the Human players could quickly glance, see Baltar and know they’re human. The Cylon cards have additional text regarding what happens if they are revealed outside of the Brig. by making ALL players look at their card(s) for 20-30 seconds Cylon players can read their card without giving themselves away. Battlestar Galactica encourages table talk. Any game that encourages table talk or group discussion can go long if the talk gets over zealous. Players who aren’t that interested in the talking may get warn down by those who get energized by it. Often one or two people will dominate the conversations and hammer home their points until others concede it out of pure exhaustion. One way to prevent this is to put a time limit on the talk. As soon an event is resolved, start a timer for say 3 to 5 minutes. Players can discuss as much as they want with each player be given the option to talk uninterrupted for up to 30 seconds (with the most verbose coming last). When the timer goes off, players make decisions and their cards are played. The time limit also helps those with the gift of gab find an economy of words and communicate more clearly. In many groups this rule in unnecessary, but in others it can save a game, turning it into a great 1-2 hour experience rather than a 4-5 hour horror story. Quicker games means you can play more games! The brig is rather important part of the base game, but it might frustrate some players who get to sit there for longer periods of time. It has an important strategical value when you want to keep those might-be-cylons in check, I agree. Pegasus expansion comes with good addition of execution. However not everybody has the Pegasus expansion and might not want to get it in fear that it makes the game too complicated. Good choice is either replacing the brig or expand on it with execution. Same essential rules apply as in the expansion, if human player the character is discarded and replaced with new and he/she pulls new loyalty card, lastly one morale is lost. In case of Cylon player he/she discards all skill cards and is moved to ressurection ship, lastly no super crisis card is drawn. Now killing your fellows should never be an easy decision, so you should make it more harder to pass the skill test (I would suggest positive cards being political and leadership). If you decided to expand on brig function, make it easier to kill the person in brig. Activation should still happen from Admirals quarters.